So I’ve been SOOO impressed with seeing lashes that look like extensions and lashes that are so long that I’ve been doing research into two products. Rodan and Field’s lash boost serum has become so popular that it sells out from the manufacturer. *For best results, use Lash Boost for 8 weeks. I’ve decided to not only get this product for myself, I’m going to be selling it as well!! I will be posting my own before and after pictures as well!! So check back soon! 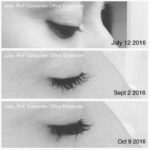 This entry was posted in Reviews and Compliments and tagged Lash boost, lash boost serum, R+F, Rodan & Fields Rep, rodanandfields, Stoneham.